Five Syrians with stolen Greek passports tried to enter the United States from Honduras. 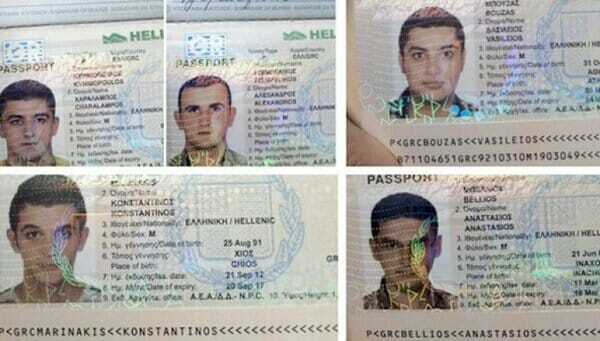 The passports had been doctored to replace the photographs with those of the Syrians. The Syrians were held in Honduras after their arrival from Costa Rica. Honduran authorities have detained five Syrian nationals who were trying to reach the United States using stolen Greek passports, but there are no signs of any links to last week’s attacks in Paris, police said. The group of Syrian men was held late on Tuesday in the Honduran capital of Tegucigalpa on arrival from Costa Rica and they were planning to head to the border with neighboring Guatemala. The passports had been doctored to replace the photographs with those of the Syrians, police said. Three Syrian men with stolen passports from Syria tried to enter St. Maarten on Saturday. Police in St Maarten have arrested three men, believed to be nationals of Syria, who tried to enter the country on Saturday using false Greek passports after arriving on an Insel Air flight originating in Haiti. The men in custody arrived at the Princess Juliana International Airport (PJIA) around 7:30 pm. They were held by airport immigration after it was discovered that the travel documents they presented were false. The suspects were turned over to the “Back Office” at the PJIA, which further investigated the documents and determined that the Greek passports the men were travelling with were indeed false. The suspects were remanded in custody pending further investigation. People smugglers are reportedly using Facebook to sell fake Syrian passports to migrants.